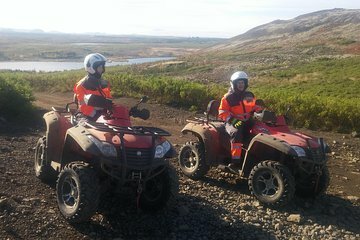 Explore Iceland on an ATV with this 2-hour private, guided tour from Reykjavik. After pickup at your hotel, drive out to Hafrafell and Úlfarsfell mountains to begin your ride. As you cruise through the rugged landscape, Esia Mountain, Hengill geothermal area, the Reykjanes peninsula, and Snæfellsjökull glacier on a clear day. Stop at a nearby farm to learn about Icelandic horses, hens, sheep, and dogs. Guide was phenomenal. Picked us up at our hotel on time. Showed us everything we needed to know to enjoy a safe ride. It was a great way to experience the landscape and view the scenery.